After many years Puccini's Il Trittico is being treated to the respect that is its due. The Met revived it recently and San Francisco also mounted it (after many years) and at ROH in a new production it has been memorialized on three DVD's. The only competition that this new release faces is the Met production that featured Renata Scotto in all three operas. It was available only by purchasing the entire box set which i did. I do not know whether each opera is now available individually: they should be. For Scotto it was a great tour de force. Il Tabarro really requires a spinto (check out YouTube for Varady and Petrella) but the performance is mesmeriziing and her commitment is unquestioned. Angelica, frequently referred to as a step child, is perhpas her greatest performance. An early Angelica was Raisa whose credentials as a dramatic soprano have never been questioned and the end of the opera clearly requires vocal resouces that most lyrics simply don't have. De los Angeles was taxed and Scotto;'s recording takes her to the limit. But watching her performance it becomes difficult to criticize when one realizes that this kind of performance, one that Italy used to provide in abundance has vanished from the vocal scene. The new performance from ROH has many virtues which clearly outnumber any deficits which in any case should not be a deal breaker. Beginining with Tabarro they have cast the Dutch spinto Eva Maria Westbroeck. Puccini may not be her ideal fach but it is wonderful to hear her lush soprano in this music; all that is lacking was the febrile energy that Scotto brought to her performanace. Antonenko was Muti's Otello in Salzburg two years ago. A young man with what appears to be a huge voice,we can only hope that he doesn't squander his talents. Alas the only Italian in the cast is Luca Gallo, a lyric baritone who after appearing in a VHS of Figaro from Vienna disappeared only to reappear as a verismo baritone. Wishful thinking. By the time Corneil MacNeil appeared in it the vibrations had loosened and he was not the steady vocal rock he had been in the late fifties and sixties. Even so he knew how to make the most of those remaining resources and they were formidable. Gallo knows how it should go, but the voice is at least one size too small. Even so it is a pleasure to hear an Italian in the role. Angelica has been relocated to a hospital ward for children run by a religious order. This is not as jarring as you might think and the singing is simply so stunning that any objection evaporates. Originally the Greek-German soprano Harateros was to sing Angelica. In her stead is a new voice, the Albanian Ermonela Jaho. It is a stunning debut in a very difficult role. Indeed in spite of my love for Scotto and de los Angeles, Jaho's may be the best performance I have ever heard of this music. Beginning with the aria "Senza mamma" to the end of the opera is one of the most shattering performances I have ever seen. The Principessa is sung by the Scandinavian mezzo soprano Anna Larsson. Usually the role is sung by a heavy (in every sense of the word) mezzo. Larsson is svelte, slender and plays the icy prinicess superbly although it must be admitted miiles away from the Mediterranean. Gianni Schicchi has been relocated to modern day Florence. Of course this makes no sense when Schicchi has to remmind the relatives about the price they will have to pay if their scheme is reavealed, but even so the performace is so ebullient that it is difficult to not enjoy what has been presented. Again Gallo, our Schicchi must suffer comparison with the great Gobbi and (perhaps even greater) Taddei. Both had vocal gifts that Italy has relinquised; both were great vocal actors and in the case of Taddei a beautiful voice as well. Gallo was chosen, I am sure, because he is Italian and one must be thankful for the gifts one receives. The Russian soprano, Ekaterina Siurina, sings a lovely Lauretta and Rinuccio a youthful Francesco Demuro--Juan Diego Florez sang this role in Vieenna--is more than adequate. Antonio Pappano surely loves thesse short operas; his conducting is all that one could ask for and the orchestra of the Royal Opera responds in kind. I must admit I approached this production with some trepidation, not knowing whether I'd find classic Eurotrash or a well-thought out updating of the original periods. I struck gold by all accounts. Il tabarro hinges on four great voces, and this production has them. Lucio Gallo is a superb baritone, with the lean, mean looks of a Ramey or a Treigle. He dominates the stage whenever he appears, be it here or in the "Schicchi"--the only singer to appear twice. Westbrook and Antonenko are moving as the doomed lovers, but I want to mention the Frugola, Irina Mishura, as a powerhouse singer and actress. Suor Angelica is cleverly staged in a children's hospital run by nuns ,highlighting the protagonist's torment. There is much fine ensemble, each minor character carefully delineated. But, of course the centerpiece is the performance of Ermonela Jaho as Suor Angelica, and her confrontation with the Princess, magnificently played by Anna Larson. Be sure to have Kleenex at hand, for it will break your heart. And then, a total change: a "neorealistc" Italian family squabbling over inheritance money, and the clever peasant that tricks them. It was as if Richard Jones were channeling a 1940'a Italian comedy. Perfect ensemble singing and acting. At the helm: Antonio Pappano, who joins my pantheon of great opera conductors. IL TRITTICO has never received the attention it deserves, but this superb video set should set the record straight. The singing in all three brief operas is splendid, as is the acting. In IL TABARRO, I was reminded of Debussy, with Puccini's offstage car-horn effects and the like. In SUOR ANGELICA, the Albanian soprano, Ermonela Jaho, sings superbly, with rock-solid High C's. IL TABARRO is the shocker it's meant to be, and the switch of the setting of SUOR ANGELICA to a children's ward managed by nuns (instead of a convent) works out very well. As for GIANNI SCHICCHI, it is just plain hilarious. The baritone star will keep you chuckling, as will the staging of the entire set. Top-notch! Go for it! Decent production. Is it the best ever? No. A travesty (the one star is out of necessity - there ought to be a choice of negative stars, which this object could have trailblazer). Each opera is worse staged and worse sung and worse conducted. 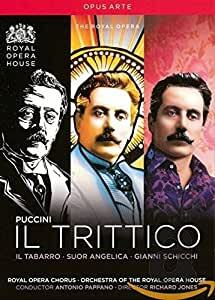 Poor Puccini, as "Trittico" was, arguably, his most ambitious project. Dramaturgically and musically more challenging than a full-length work, a one-act demands utmost rigor from the composer and librettist. Mercifully, Puccini was a genius, and each of these three operas inhabit entirely different worlds, each satisfyingly complete, and a staggering embarras de richesse when performed, as Puccini intended, together. A tall order for any company, and one this effort - and how effortful! - misses on all fronts. If a director mistrusts or dislikes a piece, then hands off. At least, dislike and mistrust are the only conclusions one can come to after sitting through these ugly, forced, music-phobic productions. Even worse is the cartoonish conducting and, worst of all, the woeful miscasting. Vocal allure (let alone technique) does not seem to have been a factor. Best to leave this heaped onto the dustbin of Artistic Malfesance. Sad.